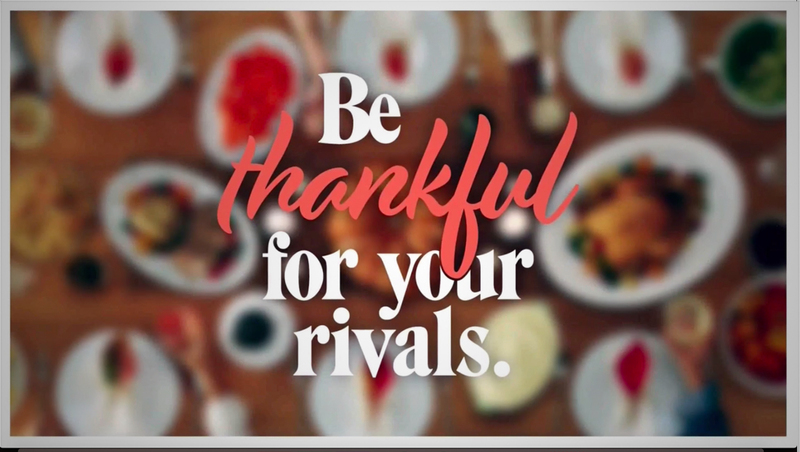 After promoting its busy Thanksgiving day with a harvest inspired promo, NBC is now encouraging its viewers to “be thankful for your rivals” in a sports-themed promo for major matchups over the extended holiday weekend. The spot uses white frames and tinted colored boxes, along with a quirky serif typeface and script typeface atypical of sports promo — all backed with stock Thanksgiving dinner imagery. Shorter versions also can be used to promote single events.